Vibrant and masterful exterior gardening gives a building a polished, welcoming signature look while enhancing the property’s value. 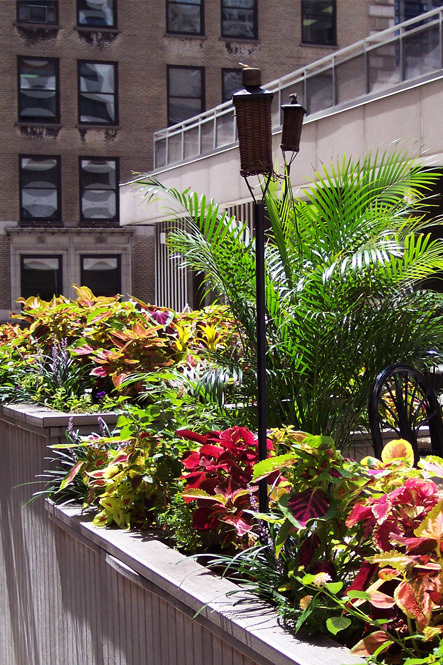 Upgrade your buildings aesthetics today without any renovation with Douglas Koch Exterior Gardening. Douglas Koch always incorporates the seasons into his garden designs. From daffodils in spring, mums in fall, to evergreens in winter, your gardens will always be a reflection of the seasons. Architecture, setting, light, and soil conditions are all taken into account when designing and selecting plants for your exterior garden. Douglas Koch is meticulous with details and aesthetics. Installation of lighting, seating, and irrigation are also available if desired. Douglas and his team bring a high level of horticultural mastery to the design and maintenance of your exterior gardens. Delivery and planting of shrubbery, seasonal blooming plants, ground cover, pruning, feeding, watering, mulching, and cleaning of all plant beds is included in the maintenance plan, at an extremely affordable rate. Not only will the gardens amaze you, our prices will make you do a double-take…Yes, we are that affordable.